This is my new favorite recipe. I would seriously eat it every day if I could. In fact, I would be eating it right now if I had remembered to pick up more chickpeas at the supermarket. The garlicky roasted chickpeas with feta and mint come together in under half an hour and besides being quick, vegetarian, and fairly healthy this is an amazingly delicious dish. So good that I’m skipping a Shout-Out Friday to share it with you. I had to halve her recipe since I only had one can of chickpeas handy, but I was sad that we didn’t have more. This makes two generous side servings, but feel free to double the recipe for a bigger serving. Trust me, it will go fast! As a serious garlic lover I upped the garlic dosage and didn’t find it to be overpowering at all. I also used plenty of fresh, chopped mint. On another note, you may notice the recipe is formatted slightly different from previous posts! I’m trying something out. It’s called RecipeSEO and it’s supposed to help format your recipe to help with search engine placement and specifically to get picked up by the Google Recipe Search, which is unlikely for itty bitty bloggers like myself but worth a shot. There is a very convenient WordPress plugin but you can’t make changes to the formatting and I wasn’t happy with the way it looked. If you go to the site you can input the recipe and then make changes to the html, which is what I did. It took more work than normal, so we’ll test it out for a bit and see. What do you think? Any recipe SEO tips? Any sites, programs, hints that you’ve found useful? Mix together the olive oil, garlic, red pepper flakes, salt, and pepper. Put chickpeas into baking dish and toss with olive oil mixture until the chickpeas are well coated with oil. Season with salt and pepper. Put chickpeas in the oven and roast for 15 to 20 minutes, until chickpeas are slightly browned and barely beginning to crisp. Remove from the oven and allow to cool slightly. Transfer to a serving dish and stir in the feta and mint. Season with additional salt and pepper as needed. Serve with lemon wedges. So glad you liked it! And thanks for the kind words about my blog! Thanks again for an amazing recipe, Kalyn! And no problem – your blog is beautiful! Mmm, can’t wait until summer and feta is in practically everything I eat 😀 I’m not a fresh mint person but I imagine this would also be sublime with basil. Looks beautiful! Ooh I bet this would be great with fresh basil. Many would probably be lovely – parsley or cilantro could also work nicely. That looks like a great recipe! When I was growing up in Singapore, we used to have these little snacks in paper cones sold by Indian peddloers called kacang putih which is basically just roasted chickpeas! This reminds me of it, but made a lot classier and summery! Yum! Ooh yum. They have snacks like that on the street in India as well, I love it! This is definitely similar, although not quite as crispy. Definitely delicious. Roasted chickpeas make for a wonderful snack and you do have some great flavor additions in this recipe. I will need to try. Have a great weekend! Thanks Tina! It was great, I hope you enjoy it if you try it. Have a great weekend as well!! These sound delicious and I seriously have mint growing like crazy in my yard. Saving this recipe! Thanks so much for linking up at A Little Nosh! Thanks for hosting it!! Great linky party. I LOVE chickpeas and make lots of salads, pastas, etc. with them. I CANNOT wait to try this and have enough in the house to do so tonight–or maybe earlier for lunch. And thanks for the info on the recipe format. I like it and might even try it. Excellent! I always have a can of chickpeas on hand, they’re so good in everything! I had FRESH green chickpeas for the first time this year too – also amazing. Glad the recipe format stuff was helpful too! I’m still playing. I just found Easy Recipe http://www.orgasmicchef.com/easyrecipe/ and think I like it even better. I finally made this last night. Sadly, it was super hot here so I tried baking them in the barbecue which got too hot and charred most of the beans. I picked out the unburnt beans and after tasting a few wanted to cry that I had burnt the others because they were so delicious. Even the fully burnt beans were still delicious. I’m making this again tonight if its cool enough or this weekend for sure. Thank you for sharing this recipe. It was an eye-opener for me! These look like a delicious snack — I love mint! I love mint too! I’ll look into RecipePress, thanks so much for the tip! Today I found EasyRecipe http://www.orgasmicchef.com/easyrecipe/ which I think I like better than RecipeSEO. We’ll see. Thanks again!! Wow, that looks fantastic. 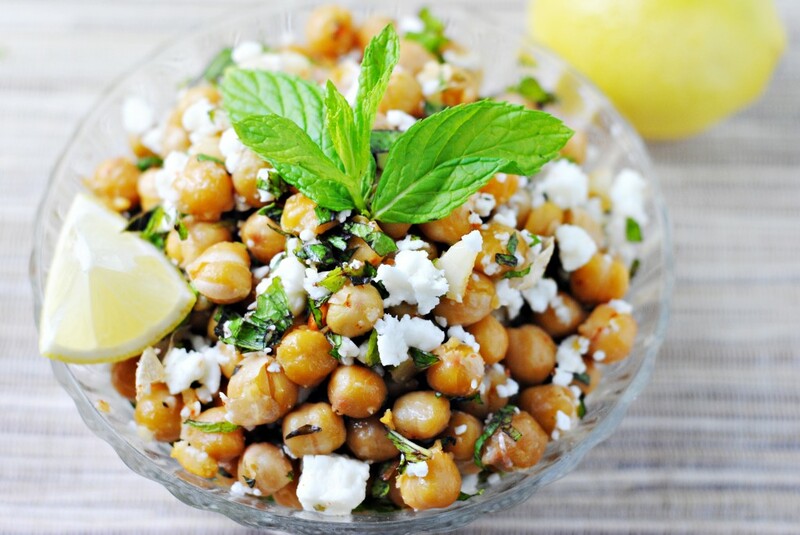 I love roasted chickpeas, mint and feta, so there’s no doubt I’d love your salad! I’ll have to give it a try ASAP. It’s really a great combination. I don’t know that I had roasted chickpeas before but I loved it. Hope you enjoy it if you do try! I love this – my favorite kind of food! Me too! Simple, tasty, healthy. I don’t think I had ever roasted them either but I loved it! Roasting gives the chickpeas a nice texture. Hope you enjoy! I’ve been trying to learn more about gluten free and be way more conscious of it and this is totally gf! I’d skip the garlicky part, but the rest sounds awesome! WOW – I need to make these ASAP! Love the garlic and all of the flavors. Thank you for sharing such a wonderful recipe! I’m so happy you like it Lisa! This was one of my favorite things that I have made recently, it comes together really nicely. Thanks so much! It tasted pretty darn good. Such a great idea to serve them as snacks – I bet they are amazing with paprika (one of my favorite spices). I hope you enjoy this as much as my husband and I did! That looks and most likely taste delicious. The photographs are gorgeous; the chickpeas are talking to the reader. I love chickpeas and use it in many different ways, but never tried it with feta so this is my next venture. Thank you so much Jayne! The chickpeas and feta went really well together, a natural pairing! A friend of mine was having a birthday party today. The fare was scheduled to be hot dogs and hamburgers; while I adore hamburgers and tolerate hot dogs, at functions such as these, I like to bring something lighter and veggie-based. I decided to give this recipe a shot and was quite pleased with the results. It was well received, which is always nice. My wife remarked that this was like a deconstructed hummus, and I had to agree. This was a good side dish. Harry I am so glad that you were pleased and the dish was well-received! (That rhymed, didn’t it?). Thank you so much for letting me know! I love roasted chickpeas and this looks amazing. I especially love how you’ve paired it with feta and mint. Yum!!! Thank you Jennifer! Yes, it’s hard to go wrong with this pairing. Chickpea “salad” is my go-to lunch! I’ve always used Orangette’s recipe, but this version looks awesome, too. Thanks for sharing. Such a good lunch! I’ll have to check out Orangette’s version, love her! This is going on the table this week! I roasted some chickpeas for the first time a couple of weeks ago and I’m hooked! Thanks for sharing this recipe. I hope you enjoy! I’m totally hooked on roasted chickpeas as well. I made this recipe and it was great – simple, healthy and yummy – my boyfriend finished it all in one sitting :-). Just got a big bunch of mint in a coop pack, so I made this for lunch today–simple and delicious! A squeeze of lemon and diced sundried tomatoes make excellent additions as well. This dish looks so tasty and healthy as well.